It’s Time for New Medtech Materials—Could Academia Help? A specialist in implantable structures offers ideas on how to drive new materials development. Examples of implantable fabrics. Image courtesy of Secant Group. Collaboration between medical device manufacturers and academia could bring about the emergence of such “active” materials, said Harris. “There needs to be a marriage between academics and commercial activity,” he said. “Academia has access to science and cutting-edge research, and it takes a high-level of risk to be able to do this research. “But academia can be stuck in research mode and often don’t consider commercial or regulatory requirements needed to market a new technology,” he continued, so the medical device industry can help academics think about scale-up, shipping, storage, shelf-life, sterilization, packaging, quality assurance, regulatory, and other considerations for readying products for market. “Commercial companies have all this in mind during all stages of development,” he added. Harris said that Secant has been collaborating with academic institutions. “We recognize the need, and we are still in the early stages, but we are reaching out for our own development,” he said. The company develops implantable structures for medical devices and offers contract manufacturing support. 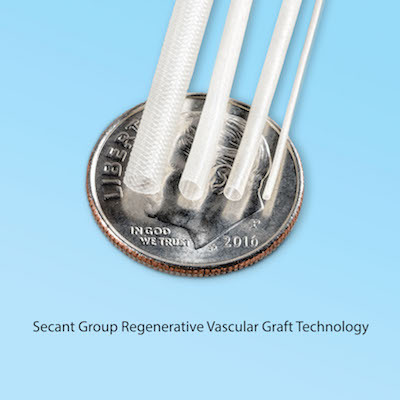 Secant would like to pursue off-the-shelf materials for medical devices. “Our business plan is to take development as far as we can and partner with medical device companies so they can take it further,” he said. One example is the Regenerez bioresorbable resin platform. When asked whether academia could help with new test methods development, Harris said they could. "Since they typically have a deeper understanding of the science, they could develop new testing procedures," he explained.